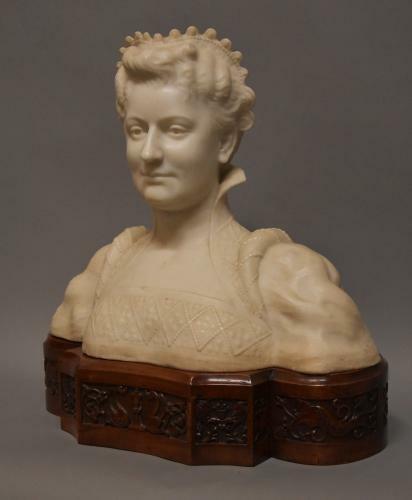 This superbly carved carrara marble sculpture depicts an Italian noblewoman in traditional Renaissance dress wearing a decorative headdress with a high collar dress, the doublet bodice being decoratively embroidered and beaded. The marble is supported by an original shaped and carved walnut base having carved panels depicting mythical beasts and flowers. Although there is no evidence of a signature there is no doubt that this marble was sculpted by a very fine craftsman of the latter part of the 19th century. This marble and base are both in very good condition for age and can go straight into a home.